The race is on to slip around Cape Reinga and North Point, the northern tip of New Zealand, ahead of the dash down the east coast of the North Island and into the finish of Leg 6 of the Volvo Ocean Race. 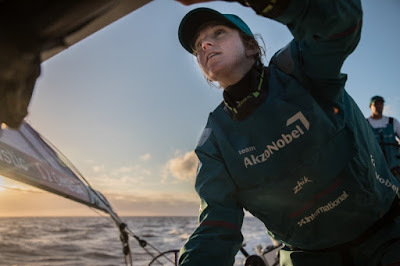 On Sunday afternoon at 1300 UTC, it was team AkzoNobel as the pacesetters, leading a southern grouping of three boats who eased out of the doldrums ahead of the chasing trio earlier this week. AkzoNobel, Turn the Tide and Plastic and Scallywag have held the advantage for days, getting into the new pressure first. Although they are sailing a greater distance to the finish, sweeping in from the west, the extra speed more than compensates. “The current picture to Auckland doesn’t show the pain we thought we were going to see,” said Turn the Tide on Plastic skipper Dee Caffari. If the weather news is good for the leading group, it’s not as favourable for the trailing trio. “They are going three or four knots faster than us. I don’t think there is anything we can do to come back,” said Dongfeng skipper Charles Caudrelier. Instead he has his sights on winning his southern group, over Brunel and MAPFRE. With just over 500 miles to go for the leaders, time is running out to make a move.